Lowri Amies has had a hard couple of years, losing her mother, grandfather and (as the programme informs us) recently her grandmother. 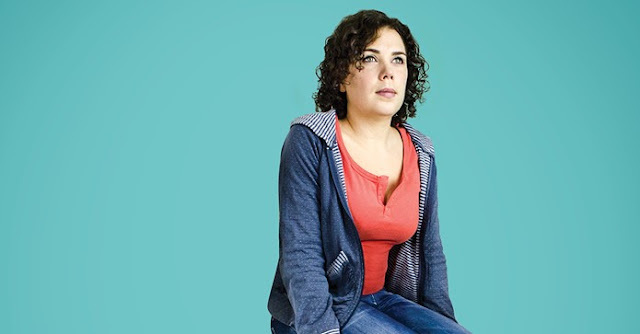 Words Words Words is a one woman show that doesn't so much explore as rugby tackle grief. Faced with being a "half orphan", Amies explains how she "lost her voice and the old words failed to fit the new story". Now we watch her attempting to rediscover it, via her dramatic training and more specifically through Shakespeare. Half biography and half confessional, Words Words Words begins with Amies explaining her grandfather's slide into dementia, before moving onto the guilt, misery and self-hatred she experienced after her Mum died. Right now you're probably thinking that this doesn't exactly sound like a fun night out in the West End. You'd be right, but trust me, it's an emotionally and intellectually rewarding one. In emotional terms you really get to see an intense personal self-autopsy. Doing a show like this has got to be tough - having to dredge up the most painful moments in your life over and over again before an ever shifting crowd of strangers. You'd fear that this repetition might dull the edge of the show, but every fragment of misery is keenly felt. It's genuinely heartbreaking to hear Amies' self-loathing at blaming her mother for keeping her in the dark as to the seriousness of her condition, or the way she was able to keep from crying when her beloved grandfather died. I think Huxley's on the ball here, Words Words Words is an attempt to communicate something so immensely powerful that it runs into the limits of language. Amies' workaround is to delve deep into Shakespeare - after all, if the greatest playwright ever can't convey loss, guilt and depression who can? Incidentally, Amies' delivery is pitch-perfect, effortlessly conjuring up everyone from big hitters like Hamlet to minor characters like the Nurse from Romeo + Juliet. Shakespeare's lines meld with Amies poetry, blurring the lines between where the bard ends and she begins. The combination serves to elevate both - the raw personal nature of Amies story accentuating the universal humanity in Shakespeare, and providing gravity to her own writing. This also makes the moments of levity more effective - at one point she says she feels "cut in two like..", you expect to her to follow up with some flowery Elizabethan metaphor, but you get "like that guy was in Kingsman". The idea of the power of words keeps simmering in the background, Amies explaining feels them caught in throat like a billiard ball stuck in a pocket. Gradually a mosaic is constructed from her grandfather's delusions that his hospital room was filling with water, to the ominous "DNR" commandment issued by her mother, to a syllabic dissection of the word "metastasised". She also has a powerful grasp of imagery, my favourite being a description of her family as a pyramid with her at the pinnacle, only it's upended and all the pressure is on her. Can words ever truly encompass the misery that Amies felt (and continues to feel)? Perhaps the only appropriate vocalisation is a ragged howl into the abyss. As someone who's never experienced loss like this I can only sympathise deeply with Amies and fear the day something like this happens to me (as it will everyone). I hope Words Words Words provides the catharsis, but either way it's one of the more memorable nights I've had at the theatre in some time and has given me a hell of a lot to think about. Words Words Words is at the Leicester Square Theatre until 21 May. Tickets Here.